The leaves are turning and the Halloween decorations are being put up and the crisp cool evenings call for a warming and delicious soup. This is IT! I love love love Ina Garten, the Barefoot Contessa, and have been making her butternut squash soup for ages. It is a combo of the squash, apples, onions, and garlic that have been roasted in the oven, then made into a soup using broth. You can use either chicken stock or vegetable broth, if you want to keep it vegan. 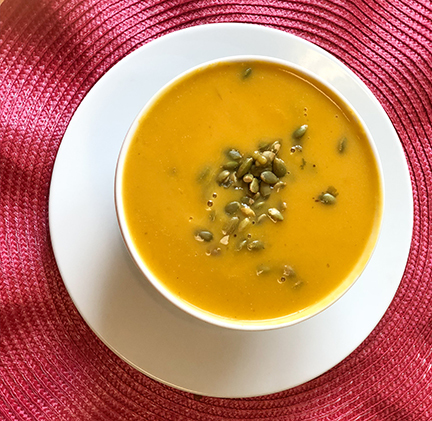 It is a deeply satisfying soup, but I always feel hungry an hour after eating it, and wondered about using a coconut milk to give it a little more fat, while still being able to keep the soup vegan, and Whole30. The amount and the quality of the curry really matter to the overall taste and warmth of the soup, so I always have a good mild curry powder on hand, and prefer the Watkins brand, or curry from my food coop. I was pretty skeptical about using an Instant Pot, just because the depth of flavor that comes from roasting the vegetables is worth that step and time. But, you can usually do a good saute of vegetables in the IP, and deglaze the pot correctly, and that gets you LOTS of flavors. So, I decided to try it. By sautéing the onions, with a little garlic, and then deglazing the pot correctly, you can get a lot of flavor for the soup. The addition of the coconut milk gives the soup some body, and helps with the fullness factor. Everyone who tasted it LOVED it and wanted more. That is the world’s best compliment to me! It's soup season! Watch as we make this amazing curried butternut squash soup LIVE! Prepare the squash: microwave the butternut squash for 6 minutes, remove to cutting board to cool slightly. Slice off the outer skin, cut into halves, and remove seeds. Cut the halves into eighths. Hit sauté on the Instant Pot, and add the oil of your choice. When hot, add the onions and cook for five minutes, stirring occasionally. You want them to brown. Add the garlic and sauté for one or two minutes, and then deglaze the pan with a cup of the broth. Add the rest of the broth, and the apples. Lock on the lid, set toggle to sealing and pressure cook on high for 18 minutes. When cooking is finished, quick release the steam and carefully remove the lid. Add the curry powder, salt and pepper, and the coconut milk and then blend with an immersion blender. Note: if you are not sure about curry, start with a 1/2 Tablespoon and taste before serving.